Almost 70,000 Mainers are being denied access to life-saving health care by Governor LePage. 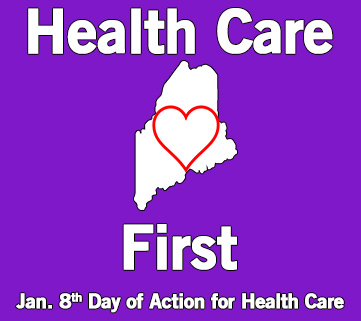 On January 8th, our elected officials start a new legislative session, and their first priority should be reversing the Governor’s decision so thousands of Mainers can receive the health care coverage they so desperately need. Preventing access to health care could mean the difference between life and death for some Mainers. It shouldn’t be a political game. It’s time our elected officials got the message. Join us on the opening day of the legislative session to tell our elected officials that access to health care needs to be their first priority. We’ll start the day with a training, followed by a rally at 10am. Before lunch (included), we'll meet with legislators in small groups.